Our Ambassadors represent Our Company on the water. They gather fishing data weekly, so we have the most up to date fishing information. This ensures that the advice we give out in the shop is current, accurate, and as helpful as possible to help our customers catch more fish! If any angler has questions on the river, they help, suggest bugs techniques and more. These waters belong to everyone, and we want everyone to have the best possible fishing day! This group of anglers also field tests the products we sell to ensure that we can suggest the best products on the market, both in store, and online. Being a Coloradan, naturally, I grew up fishing, camping, snowboarding, and spending a fair amount of time in the outdoors. My father turned my brothers and I into traditional fisherman but it wasn't until the fall of 2014 that I realized I was doing it wrong and picked up a fly rod and haven't looked back. The sport has enveloped me and any amount of free time I have. Fly fishing, snowboarding, camping, hiking, and spending time on the many public lands we all share are all important parts of my core values. When I'm not hunting trout, obsessing about trout, looking at pictures of trout, reading about trout, catching trout, or reading about catching trout, I'm most likely doing something else in the great outdoors. Did I mention I like the outdoors? "The Patagonia Foot Tractor wading boots. Previous boots left me slipping and sliding all over the river. The foot tractors are without a doubt a game changer, no more slipping and sliding with these bad boys. The metal bars grip to rocks with ease and give me the confidence I need to maneuver the river bottom safely." Years ago on a sunny November day, I perched on a stone pier off of E55th in Cleveland, Ohio and caught my first Steelhead Trout. I still cannot comprehend how much that moment has continued to change my life. Landing a 28in Steelhead rerouted my academic focus and inspired new meaning to my artistic endeavours. For my Masters, I used my undergraduate degree in Studio Art; Painting, as a tool to spread conservation messages and solutions in regards to the protection of Ohio’s delicate trout populations from numerous threats. In Ohio, Brook Trout are the only native trout and are extremely scarce. Steelhead fuel our fly fishing sport fish community, while random stray Browns and various species of Salmon come through our tributaries on a whim. Sadly, you can only fly fish for such species during limited months of the year. For this and many other reasons, I knew it was time to relocate. In the Pursuit of Trout, I packed all of my fishing and camping equipment into my newly acquired FJ Cruiser and hit the road. I was lucky enough to fly fish in many beautifully wild places on that 8,000 mile solo road trip. Since June 2017, I have resided in Denver and have continued my master's work as the graphic designer at Denver Outfitters. I fly fish as much as possible and am always looking for new places and people to go fly fishing with. "I love my Patagonia fishing vest for long alpine lake hikes in the summer and fall." Est. 2/18/79- born in Edgewater Colorado. The strongest women I know are my sisters and my mother, and love them to death. I remember my mom telling me on numerous occasions growing up, “Your dad wants to take you fishing”,,. That feeling I would get is a feeling I still get when I think about it. Talk about not being able to sleep! My father was a spin reel angler, loved his beer, worms, power bait and the jiggle on the tip of his ugly stick. Listening to Merle Haggard, Willie Nelson, Waylon Jennings, and smelling that sweet stench of a Marlboro cigarette well I laid on his lap sleeping anxious to get to the lake. Release date 9/10/15, boy oh boy was I ready! I hit life hard... started working, that was the only thing on my mind was taking care of everyone I loved. I started my own plumbing business “Bulldog Plumbing” and I was doing a job in Golden... Here we GO! Arbor Anglers GRAND OPENING I saw the sign off the road. Hmmm, fly fishing... been a spin guy my whole life, but I was always curious about fly fishing. Knowing my life was in a transformation I didn’t hesitate walking thru those doors. Addicted instantly! Becoming a fly angler and building an awesome relationships with Nick, I knew I was where I was supposed to be. Im 45+ months sober and I am going to live the rest of my life with not a bottle in my hand but my fly rod! Thanks for taking the time to read my bio... and getting to know a local hometown boy who went from rags to riches, not thru money... BUT LIFE! Out of all the toys own my 4wt and 5wt G.Loomis Asquith rods are my favorite. Fly fishing is an art, and to complete a master piece you need the tools! "My FishPond Nomad net! I had a really shallow cheap net beforehand where fish weren’t as safe when they were flopping around. The nomad is super deep and holds fish really nicely so you can get the fly out then get a quick photo op and off they go!" Grew up in Monument, Colorado and have been up and down the Front Range ever since! I grew up spin fishing and was absolutely obsessed as a kid. At the lake I was always the first one up and down at the water catching perch, sunny, and bass. Then when we moved to Colorado in the 6th grade my dad got me a fly rod thinking I could get into fly fishing. As most middle school girls do, I got side tracked with sports, friends, etc. Athletics took over my life in high school and college and I let that Sage Graphite II with a Ross Colorado reel sit there for years. (I am lucky my dad cared about quality because years later that was still a decent setup!) Finally, in grad school I decided I wanted to reinvest myself into fishing and set out to learn how to fly fish. It wasn’t until I met a friend of mine, Blaine, that I really started to “figure it out.” That was about 3 years ago - the rest is history! Born in Ventura, California and spent the majority of my life in Austin, TX. I am an Outdoor Photographer which is why I made the move to Colorado. Growing up in Austin, TX I was always surrounded by lakes and the ocean is only 3 hours away. I was raised in an action sports oriented family. We spent all of our time racing motocross, wakeskating on the Colorado River, riding bikes, and fishing from the back of the wakeboard boat. My Dad went back and forth from bay boats to bass boats, but finally found our second home in Corpus Christi where we spend a ton of time Surfing the Gulf and Fishing for Reds in the Bay. Summer of 2016 when packing to move to Golden, My dad threw me a rod case packed with his old Berkley Rod and Reel from High School (Woodland Park then Steamboat for College), as well as my late Grandfathers Garcia Rod and Reel. I had always been interested in Fly Fishing, but it was never big in Texas until the past few years. I have now spent the last year driving around Colorado throwing flies at fish of all sizes and shooting photos of Colorados' beautiful landscape. 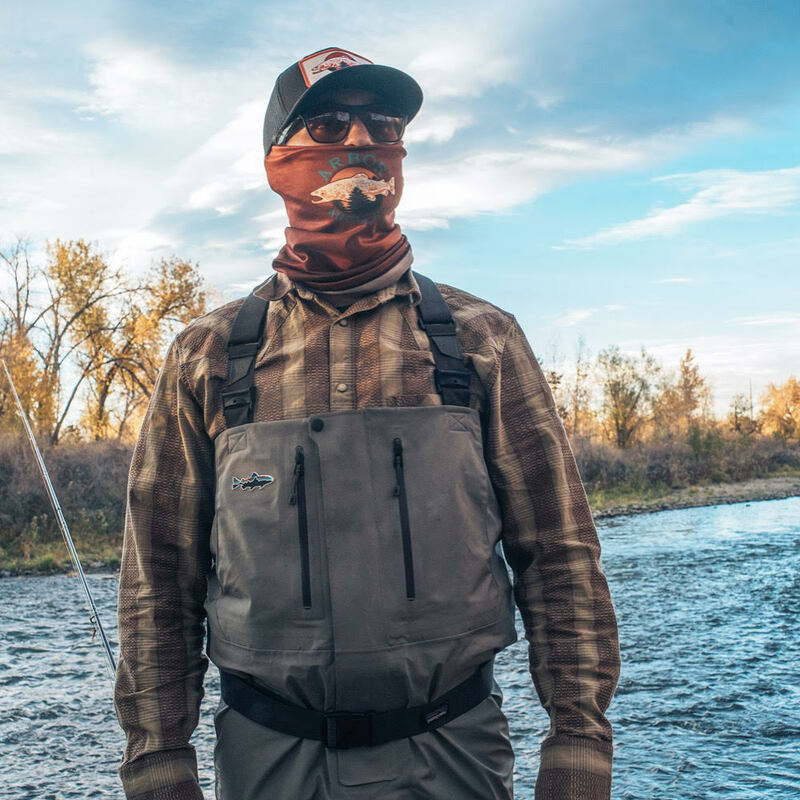 "Patagonia Rio-Gallegos Zip-Front Waders. These waders definitely elevated my fishing a few levels above where I was. The quality is top-notch from Patagonia. They have provided so much comfort in any weather, and have provided confidence that they will keep my stuff and I dry in many situations. For Fly Tying the Peak Fishing - Rotary Fly Tying Vise has vastly improved my fly tying as well as my fishing. The knowledge of how to tie flies on an awesome vise has elevated my fishing by being able to tie the fly I need for any situation I have run into." Grew up in the beautiful PNW! (Oregon) and I've lived in CO for a little over 5 years now. The first time I had ever fished was about a year ago. My friend Emily is obsessed with fishing and I went out with her one winter day when it was too cold to climb. Rock climbing is how I spend a lot of my time so when I injured my elbow in March I had to let it rest and fishing really grew on me! Now when I'm out on trips I find myself not only looking up and dreaming of delicious splitter granite cracks, but also down to the swirling river, wondering what kind of fish are swimming below. Email Us to Find the Right Pair! I grew up in the mountains of Evergreen, CO, and began fly fishing at a pretty young age. I've been very fortunate to go fly fishing in a lot of amazing places from trout fishing in Montana and Alaska, to saltwater flats fishing in Belize and Mexico, and catching whatever I can hook into in Colorado from trout, salmon, and grayling, to northern pike, bass, and carp. Growing up, it was all about trout fishing. In fact, I didn't even realize you could catch a bass in the state of Colorado until I went to school at CSU in Fort Collins and began hitting up some of the local city ponds. 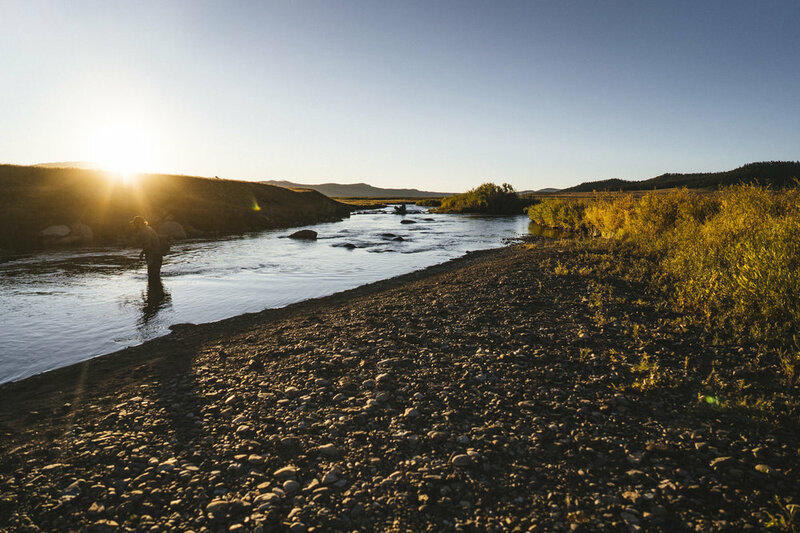 Although my favorite type of fishing is still wading through a river for trout, it was this realization that I could catch warm water fish in Colorado, on a fly rod, that really enhanced my passion for fly fishing. When fishing, there are a lot of good rules, guidelines, tips, and tricks that should be followed. One of my personal rules, which I hold near and dear to my heart, is that you can't crack a beer until you land your first fish (and be sure to pack out that empty can). "A good set of polarized sunglasses. As someone who has witnessed a person take a Woolly Bugger to the eyelid, I can't say enough about proper sunglasses, not only as a safety precaution, but as a tool. A good set of polarized sunglasses, especially some Smiths with ChromaPop, are an absolute game changer for spotting fish. You're fishing blind without polarized sunglasses, and you may actually become blind without them as well." "My long handle Fishpond net was a game changer for me and being able to comfortably land large fish while solo on the river. That, and my Patagonia windproof, water proof wading jacket which has kept me warn and dry on the river (and looks great with jeans in the city!)" Growing up in South Florida I was always on or near the water so for me every time I’m standing in a river waving a stick, it’s like coming home. Always one to find my own adventures, Colorado was a natural fit for my active lifestyle. Running a fitness business doesn’t only mean I like lifting weights and helping others do the same: it means backpacking trips to remote trout streams and ponds, rigorous day hikes to alpine lakes full of hungry trout and a lot of parking lot workouts when I’m car-camping next to a river. The demanding yet rewarding task of hiking up a mountain with fishing gear provides me with the physical outlet and environment I thrive in and to be able to catch some of the most stunning fish at 11,000 feet with not a soul in sight: heaven. They say it’s about the journey, not the destination and that’s how I feel about all my trout related adventures. But I won’t fool you, I love landing fish almost as much as I love fishing. I began fly fishing freshman year of high school and soon fell in love with the sport. I continued to split time between fishing, sports, and school. 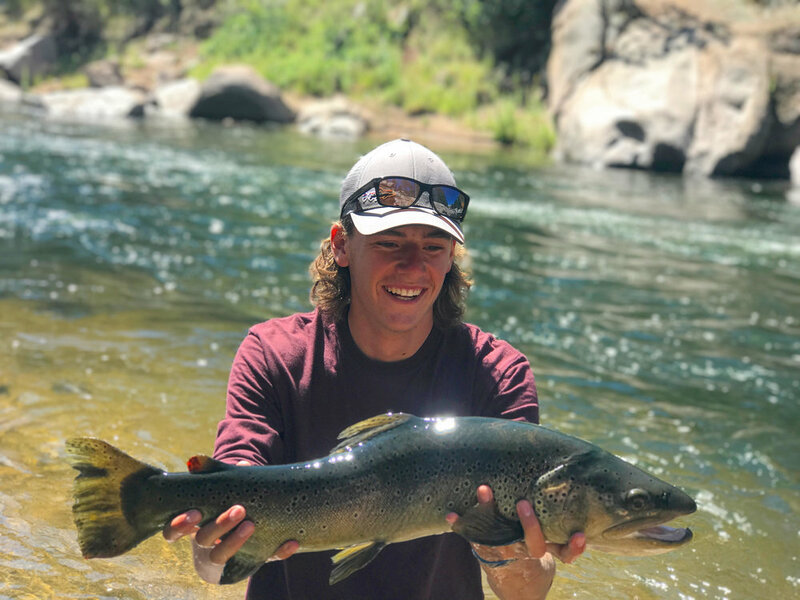 My turning point was when me and a few friends came together to start Blue Dream Angling, an Instagram page chronicling our fly fishing journey around Colorado. Since then I have fished all over the state and made a few trips around the country and up to Canada to explore new fly fishing adventures. Currently, I am planning on attending college in the fall of 2018. My favorite season to fish is the spring. I love spring because run off keeps some the crowds away and the fish are close to the banks and willing to eat. "My rotary fly tying vise changed fly fishing for me"
Buying a G. Loomis Asquith from Arbor was a huge game changer for me. I previously fished a cheaper Sage rod and had a hard time fishing 6x because the Sage did not protect the lightweight tippet anytime I had a large fish on. The fast rod tip on the Asquith has made my casts more accurate, mending line easier, and it has done an amazing job at protecting tippet so I can get bigger fish into the net. I was born in San Francisco, California and then moved to Indiana at an early age. I’ve been in Colorado for 2.5 years now. I’m an adventure junky that lives off the thrill of new experiences which means I have a ton of hobbies. I snowboard, skateboard, ride motorcycles, travel, and I have a passion for photography. When I’m not outside I’m working as a software engineer or trying to plan my next trip. Fishing in the Midwest was a big part of my childhood. My dad was a great teacher and I always appreciated the time it would allow us to have together. But throwing a big lure or live bait with a spin rod was too easy and I never had a real desire to go fishing on my own because of that. I moved to Colorado in the fall of 2015 and a friend took me out on the Frying Pan to teach me how to use a fly rod. It didn’t take long for me to realize it’s really hard but that just intrigued me more. Figuring out where the fish are, what the fish are eating, and how to get them into the net becomes a complex problem to solve but it’s so rewarding once you figure it out. Fishing to me is about appreciating the challenge, the scenery, and the time shared with my dad or the new friends I’ve made in Colorado. From chasing smallmouth bass in the Missouri Ozarks to being a trout bum in Colorado, fly fishing has been my passion for years. 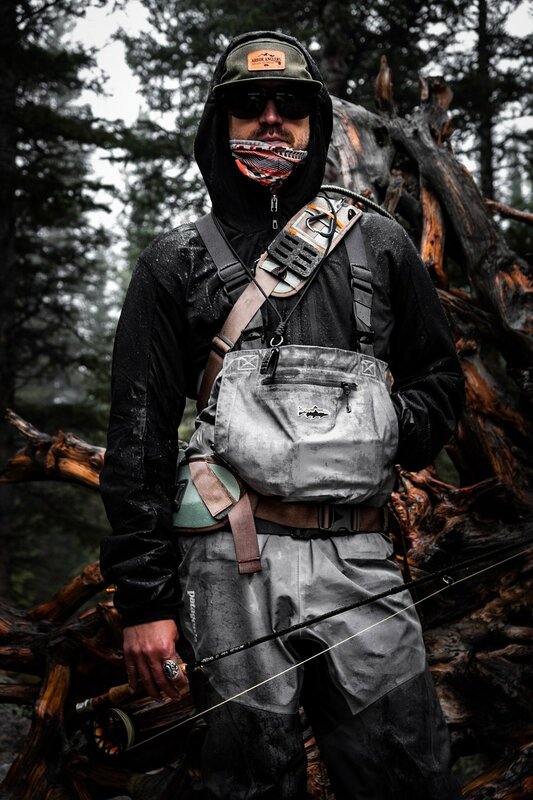 You'll frequently find me on one of our many tailwaters laughing and fishing with a group of friends, or on an alpine stream in search of wild cutthroat and brook trout. "Smith Guide's Choice ChromaPop sunglasses, hands down. Sight fishing on a typical sunny day in Colorado would be quite a challenge without them." A product that has changed fly fishing for me is the Patagonia backpack. I have been able to put everything in there for long trips in order to get those big, untouched fish. Along with my backpack, I always use a Hardy rod and reel. Both have stuck by my side through all my fly fishing experiences, and have helped me land some pretty big fish. My name is Matthew Ramirez and I am 19 years old. I have had a love for fishing throughout my entire life, and I became interested in fly fishing fairly recently. The second I picked up a fly rod, my world changed. For about a year and a half my life has revolved around the sport. Since my first experience, I have been fly fishing in every second of my spare time, going from baseball in the morning to fly fishing the rest of the day away. Lakewood Colorado has been my home for 19 years, but I ventured to Kansas for a few months to play college baseball. Baseball doesn’t fuel my soul the same way fish do, so here I am, back in Colorado. I plan to go to CSU next year to further develop my trout education.